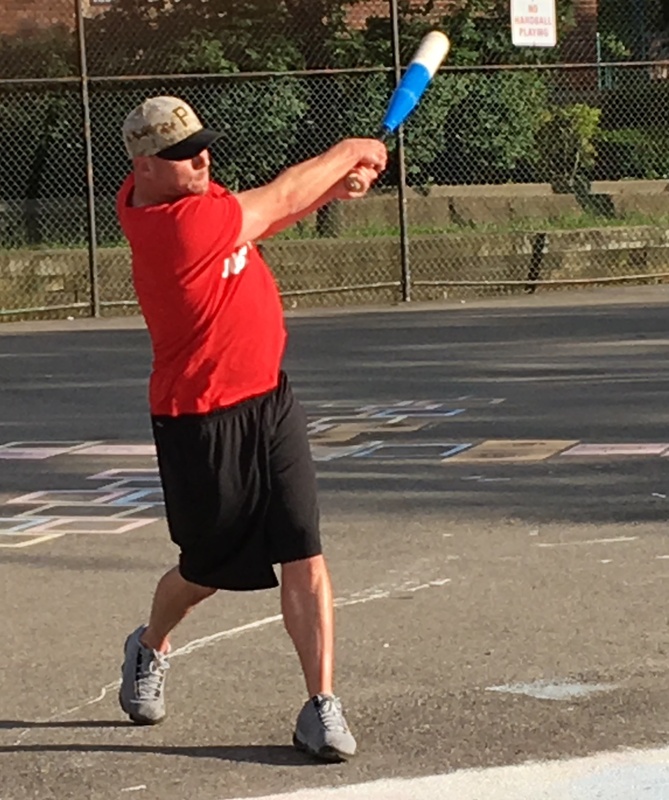 Dustin had two homers, three RBI, and pitched the complete game win the for Ham Slams as they held on to beat Cookies & Cream 5-4, passing Cookies & Cream in the tight race for second place in the regular season standings. With the win, the Ham Slams held a one game lead over Cookies & Cream. Jordan started for Cookies, and the Ham Slams got to him early. Dan doubled with one out in the top of the first, and he scored from second on Josh’s RBI single to make the score 1-0. Jordan then retired Dustin to end the inning, and the Slams led by a run. Dustin rolled through the bottom of the first, retiring the side in order. The Slams continued to swing the bat well in the top of the second, extending their lead. Dan singled with one out, and he scored from first on a Josh single that made the score 2-0. Dustin then hit his first of two homers in the game, providing his own run support to put the Slams ahead 4-0. 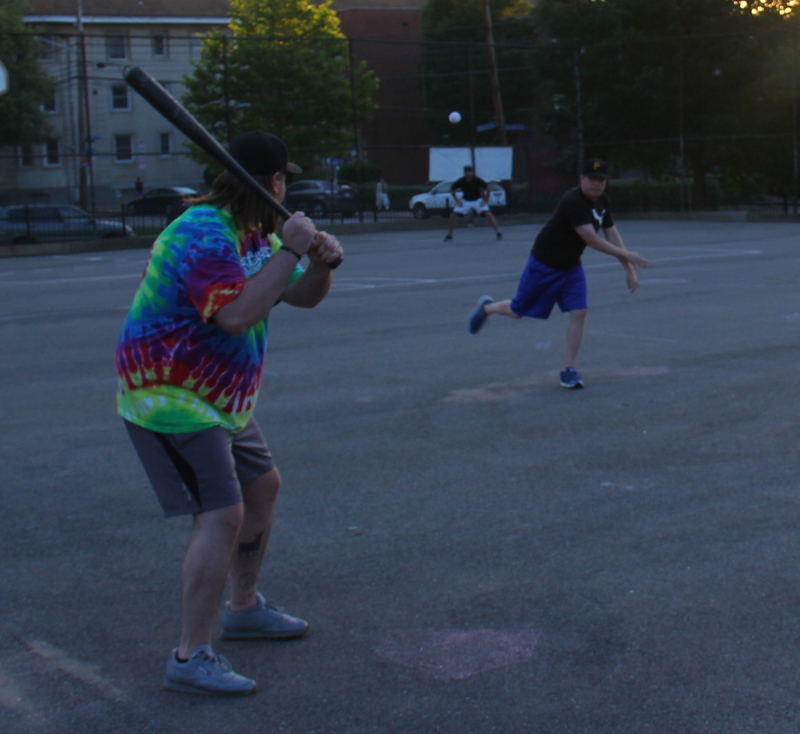 Steve followed with a triple, but Jordan avoided a disastrous inning, retiring Dan for the second out. Dustin retired Dinger and Jordan in order in the bottom of the second, and the Slams continued to lead 4-0. The Slams would add one more run in the top of the third when Dustin hit a one out solo homer to center, putting the Slams ahead 5-0. Steve then doubled, but Jordan stranded him again, retiring Dan to end the inning. Josh connects on a single in the second innings. He had two hits and two RBI in the game. Jordan would get some run support starting in the bottom of the third. After Dustin retired Joey to make it five straight outs to start the game, Erich launched a solo homer to right center, putting Cookies on the board. Dustin then retired Dinger to end the inning, and the score was 5-1. Jordan pitched his first perfect frame in the top of the fourth, retiring the side in order. Dustin matched him in the bottom half of the inning, and the score remained 5-1. Dan tripled to start the top of the fifth, but the Slams couldn’t add to their lead. Jordan fanned Josh for the first out of the inning, and Dustin grounded out to end the inning, stranding the runner at third. Cookies would pull closer in the bottom of the fifth. Erich tripled to lead off, and two batters later, Jordan singled to score him, making the score 5-2. Joey, hitless in the game so far, followed with a two-run homer to left, cutting the score to 5-4. Erich then doubled, putting the tying runner in scoring position. However, Dustin escaped with a lead, retiring Dinger to strand the runner and end the inning. Dustin led off the top of the sixth with a single, but he was doubled off when he was caught out on a Steve fly ball, ending the inning. Cookies trailed by one heading into their final at-bat, but they couldn’t rally. Dustin sent Jordan and Joey down consecutively, ending the inning and giving the Ham Slams the 5-4 win. 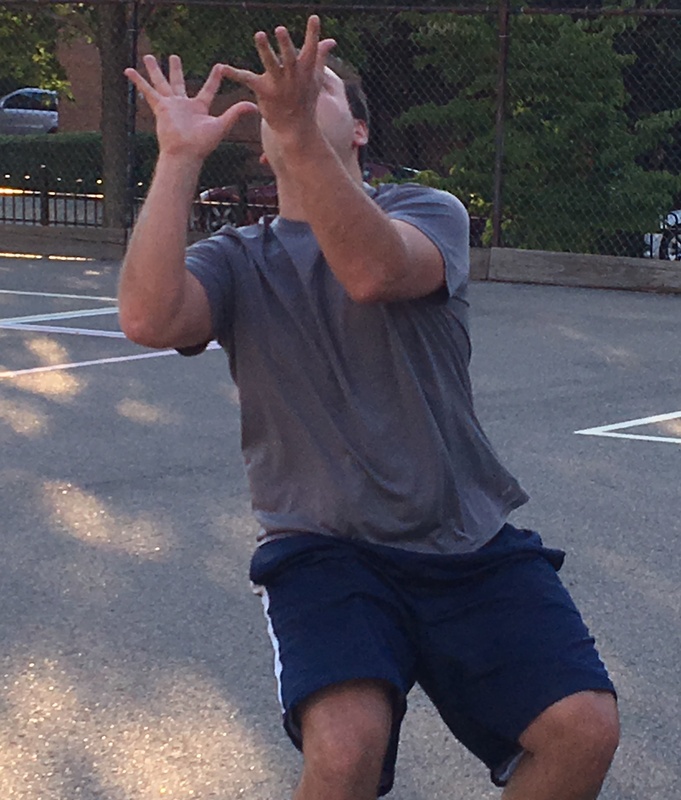 The win moved the Ham Slams to 9-7 on the season, one game ahead of Cookies & Cream, who dropped to 8-8 with the loss. – Dustin pitched the complete game win for the Ham Slams, allowing four runs on five hits in six innings. – Jordan took the loss for Cookies & Cream, giving up five runs on ten hits and striking out one in six innings. – Dustin also led the Ham Slams at the plate, going 3-for-5 with a single, two home runs, two runs scored, and three RBI. – Erich led Cookies & Cream on offense, going 3-for-4 with a double, a triple, a home run, two runs scored, and an RBI. Miller had five hits in the game, going 5-for-6 with two singles, two doubles, and a triple. Eastbound & Dahn battled back and forth with Questionable Outfit all game, pushing the first place squad to the limit before surrendering one too many base runners late in the game. 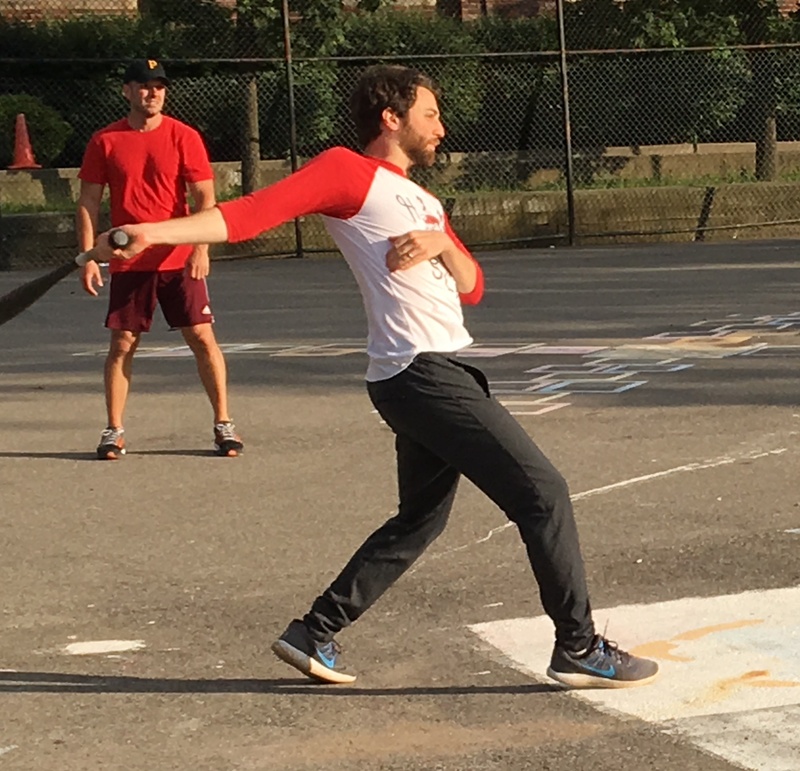 After allowing Eastbound to tie the game twice, Questionable walked off with a win in the bottom of the sixth thanks to hits from Tom and Miller. Norris, playing in place of Bob on paternity leave, took the mound for Questionable. He allowed a one out single to Ruby in the top of the first, but avoided damage, retiring Nate O to strand the runner and end the inning. Adam made his first career pitching appearance starting for Eastbound & Dahn, and he did well early, sending Mike and Tom down in order in the bottom of the first. Norris rolled through the top of the second for Questionable, retiring the Eastbound side in order, and he would get run support in the bottom half of the inning. Miller led off the bottom of the second with a triple, and he scored on a Norris ground out to center, making the score 1-0. Mike followed with a triple, and Tom drove him in with an RBI single to make the score 2-0. Miller then singled, and Questionable Outfit had two runners on. Adam buckled down, retiring Norris to strand both runners, avoiding a disastrous inning. Down 2-0, Eastbound punched back in the top of the third. Ruby doubled, and two batters later, Max Power hit an RBI single to make the score 2-1. Adam followed wth a single to put runners on the corners, and Eastbound evened things up when Ruby hit an RBI single to score Max from third. Eastbound had two runners on and were threatening, but couldn’t take the lead, as Norris retired Nate to end the inning. Mike doubled to start the bottom of the third, but Adam stranded him, retiring Tom and Miller and the game remained tied at 2-2 through three innings. Eastbound pulled ahead in the top of the fourth when Adam provided his own run support with a one-out solo homer to right. Norris retired Ruby to end the inning, and Eastbound led 3-2. Questionable bounced back in the bottom of the fourth, reclaiming the lead. Norris and Mike each singled, and Tom tied the game with an RBI single to score Norris, making the score 3-3. Miller followed with a double, scoring Mike, putting Questionable ahead 4-3. 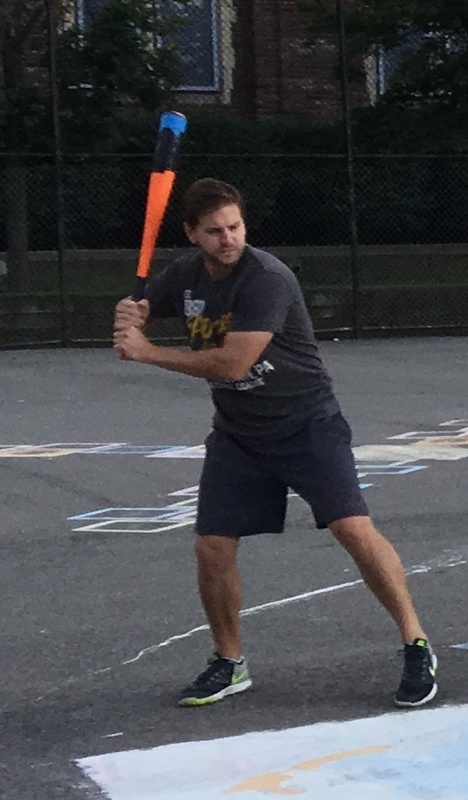 Tom scored on a Norris sacrifice fly that gave Questionable a 5-3 lead, and Adam then retired Mike to end the inning, stranding Miller at third. Down 5-3, Eastbound would fight back yet again in the top of the fifth. Nate doubled, and two batters later, Adam hit his second homer of the game, a two-run blast that evened the score at 5-5. Ruby followed with a single, putting the go ahead run on base, but Norris cracked down, retiring Nate to end the inning. With the game tied at 5-5, Questionable threatened in the bottom of the fifth. Miller singled with one out, and he moved to second on a Norris single. Questionable had two men on, including the go ahead runner in scoring position. But Adam escaped the jam, retiring Mike for the second out, stranding both runners. The game remained tied heading into the sixth. Eastbound went quietly in the top half, as Norris fanned Max and got Adam to ground out to center to end the inning. Tom led off the bottom of the sixth with a single, putting the winning run on base. Miller then doubled, and although Tom didn’t score on the play, Questionable had two runners in scoring position and no outs. Adam got Norris to ground out to right, but Tom scored from third on the play, ending the game and giving Questionable Outfit the 6-5 win. 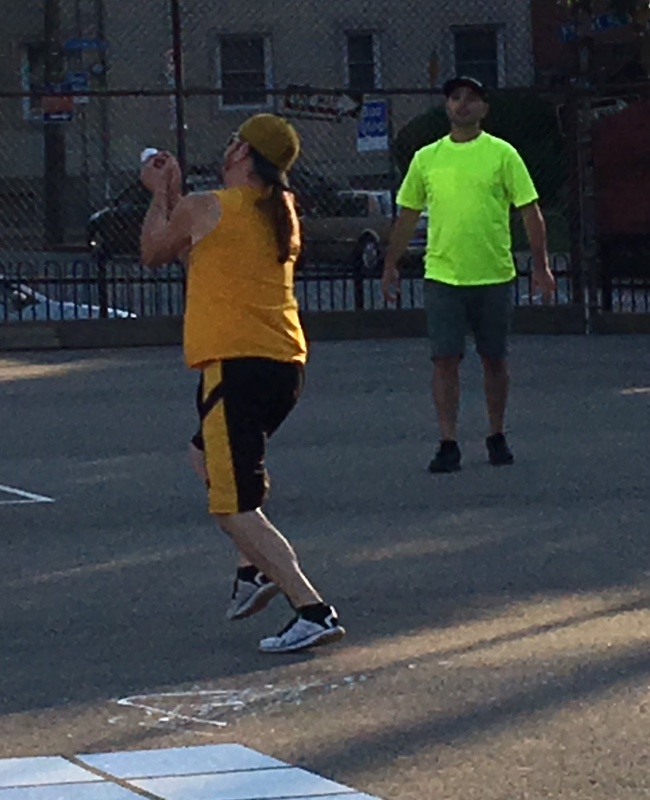 The win moved Questionable Outfit to 13-3 on the season, and the loss dropped Eastbound & Dahn to 2-14. Steve and Dan celebrate at the plate after one of Steve’s two homers in the Ham Slams’ win. Combined, they had eight extra-base hits. 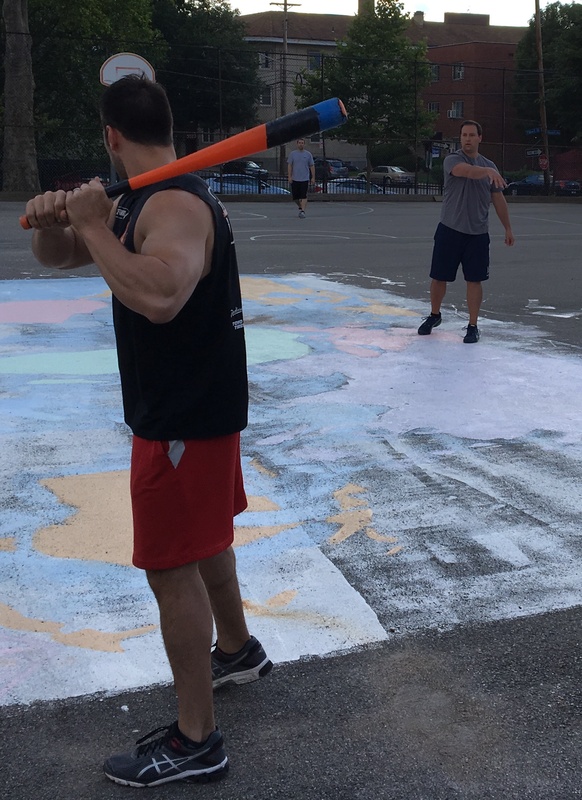 Steve and Dan each had four extra base hits and each scored three runs, as the Ham Slams rolled past Eastbound & Dahn 12-3. 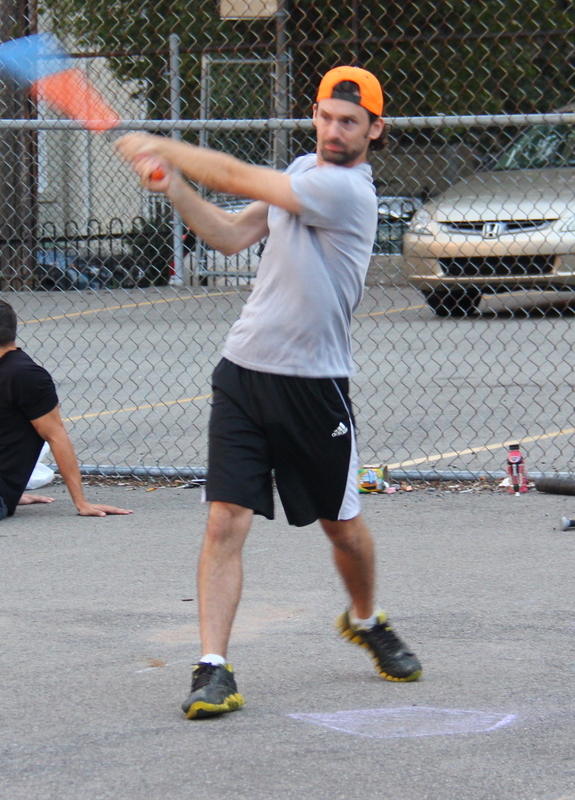 Steve had two doubles and two homers, and Dan had a double, two triples, and a home run in the Ham Slams victory. Josh started on the mound the the Ham Slams, and he retired Eastbound in order in the top of the first. Nate took the mound for Eastbound, and he started hot, striking out Steve, the Ham Slams’ leadoff batter. Dan followed with a triple, but Nate escaped the inning, retiring Josh for the second out. Nate started the top of the second with a double, but Eastbound couldn’t plate a run. Josh retired Max Power (filling in for the depleted E&D roster) and Adam to end the inning and strand the runner. The Slams would take the lead in the bottom of the second. Dustin singled, and two batters later, Dan hit an RBI double to make the score 1-0. Josh followed with a double, scoring Dan, and the Slams led 2-0. Nate retired Dustin to strand Josh at second and end the inning. Eastbound bounced back in the top of the third. Nate singled with one out, and Max Power evened things up with a two run homer to right. Adam followed with a triple, but Eastbound couldn’t take the lead, as Ruby was retired for the second out. The Slams took the lead right back in the bottom of the third. Steve doubled, and Dan followed with a two-run blast to left-center. Nate retired the next two batters, and Eastbound trailed 4-2. Dan lines up the ball for one of his four hits in the game. Josh got into a groove in the top of the fourth, sending Nate and Max down in order, and the Slams would blow the game open in the bottom half of the inning. Steve led off with a solo homer, putting the Slams ahead 5-2. Two batters later, Josh hit a one out double, and he scored when Dustin hit an RBI double that pushed the score to 6-2. Steve then crushed his second homer of the inning, making the score 8-2. Dan followed with a triple, and Josh capped the big inning with a two run shot to right. After. Dustin single, Nate retired Steve to end the inning, and the Slams led 10-2. Adam singled to start the top of the fifth, but Eastbound couldn’t rally. Josh retired Ruby and Nate to end the inning. The Slams would add a few more insurance runs in the bottom of the fifth. Josh singled with one out, and he moved to third when Dustin doubled. With one out and two runners in scoring position, Steve cleared the bases with an RBI double. Nate struck out Dan to end the inning, and Eastbound trailed by ten runs heading into the final inning. Max Power started the sixth with a double, and two batters later he scored on a Ruby RBI single that cut the score to 12-3. The Eastbound run would end there, as Josh retired Nate for the second out, ending the inning and the game. 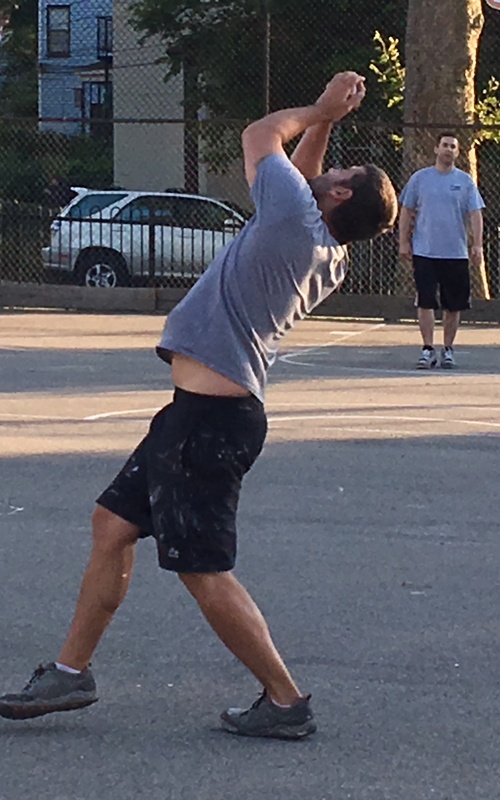 The win moved the Ham Slams to 8-7 on the year, and the loss dropped Eastbound & Dahn to 2-13 on the season. – Josh pitched the complete game win for the Ham Slams. He allowed three runs on seven hits in six innings. 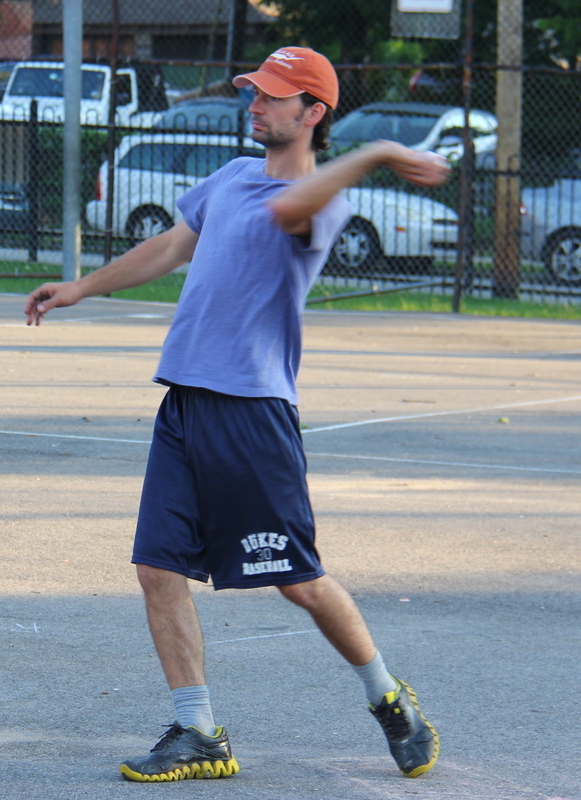 – Nate took the loss for Eastbound & Dahn, giving up twelve runs on sixteens hits and striking out two in five innings. 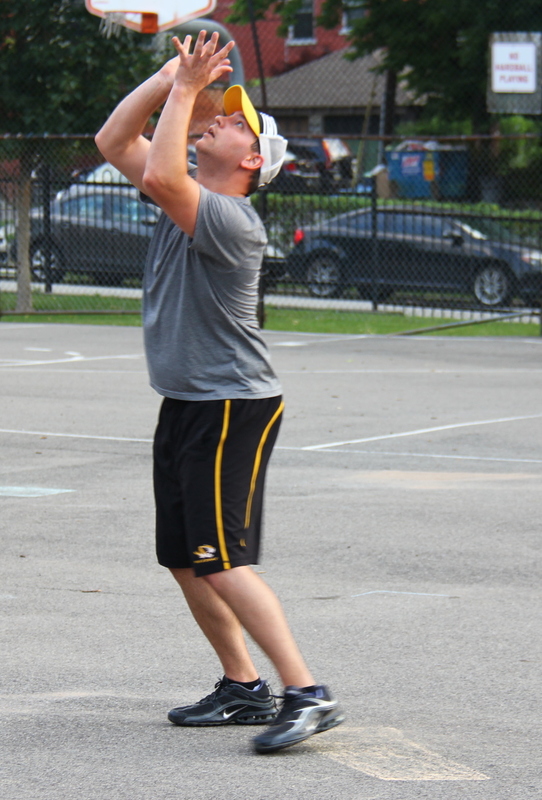 – Steve and Dan led the Ham Slams on offense. Steve went 4-for-7 with two doubles, two home runs, three runs scored, and five RBI. 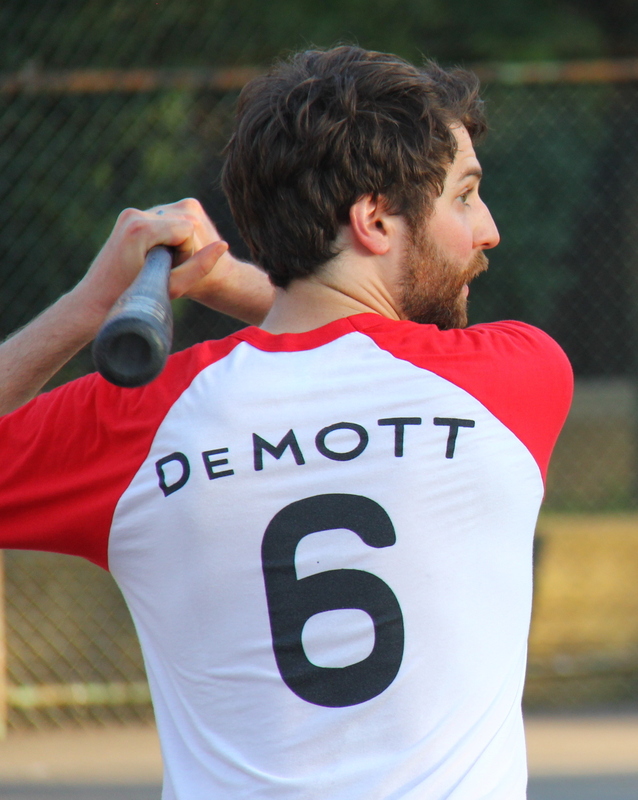 Dan also went 4-for-7 with a double, two triples, a home run, three runs scored, and three RBI. – Max Power led Eastbound & Dahn at the plate, going 2-for-4 with a double, a home run, two runs scored, and two RBI. 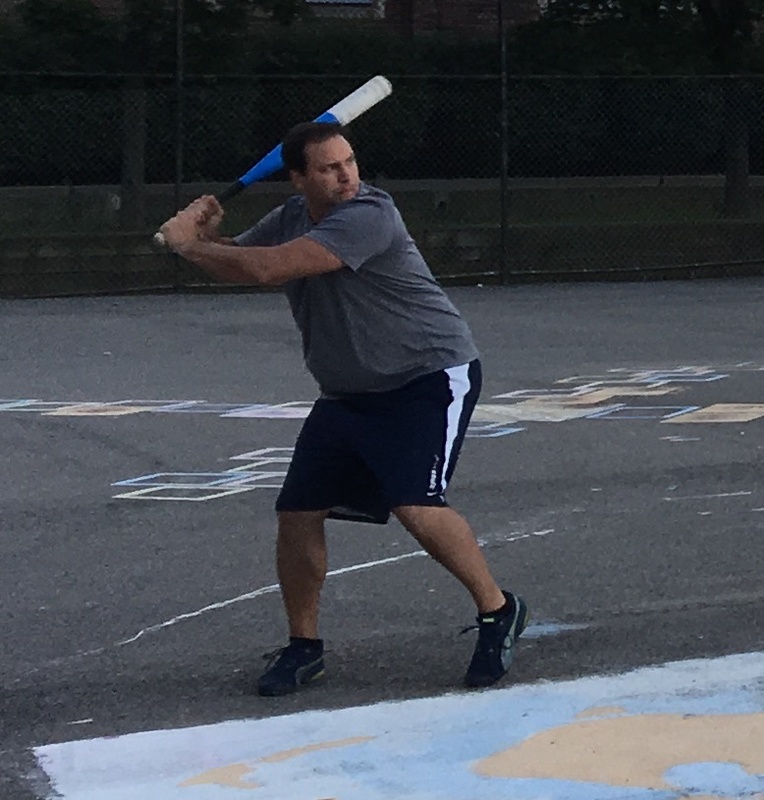 Dinger allowed only two hits in a complete game win and Blose went 5-for-6 with two homers as Cookies & Cream stormed past Eastbound & Dahn 11-1. Cara started on the mound for Eastbound & Dahn, and Cookies & Cream got to her early. Guthrie singled to start the game, and Blose followed with a single to put runners on first and second. Joey then hit an RBI single, scoring Guthrie, but Joey was caught in between first and second on the play for the first out of the inning. Dinger came to the plate with one out and a runner on second, but Cara got him to ground out to left, stranding the runner, and Cookies led 1-0. Cookies & Cream started Dinger, and the very first batter he faced, Dustin, crushed a solo homer to left, tying the game at 1-1. Dinger then retired Nate and BK to end the inning. Jordan led off the top of the second with a solo homer, and Cookies took back the lead 2-1. Two batters later, Blose hit a one-out double, and he scored on a Joey RBI single that made the score 3-1. Dinger then singled to put runners on first and third with one out, but Cara got Jordan to ground out to left, stranding two runners and ending the inning. Dinger cruised through the bottom of the second, retiring Cara and Dustin in order. Eastbound removed Cara from the mound and turned to BK in the top of the third. Blose continued to swing a hot bat, hitting a solo homer that put Cookies & Cream ahead 4-1. Dinger continued to roll in the bottom of the third, retiring the side in order. BK finally kept the Cookies’ bats scoreless in the top of the fourth, sending Dinger and Jordan down consecutively, and the score remained 4-1. Dinger allowed a one-out single to Dustin in the bottom of the fourth, the first hit he had allowed since the first inning. Eastbound couldn’t capitalize on the baserunner, as Dinger retired Nate to strand the runner and end the inning. Cookies extended their lead in the top of the fifth. Guthrie singled to start the inning, and Blose followed with a double to put runners on second and third. BK got Joey to ground out for the first out of the inning, but both runners managed to score on the play, and Cookies pulled ahead 6-1. Dinger hit a one-out double, and Jordan drove him in with an RBI triple, making the score 7-1. Guthrie flew out to left for the second out of the inning, and Cookies led by six runs. Dinger wouldn’t allow Eastbound to rally, as he retired BK and Cara in order in the bottom of the fifth. Cookies put the game out of reach in the top of the sixth, adding four insurance runs. Blose hit a solo homer to start the inning, his second of the game, and Cookies led 8-1. Two batters later Dinger singled, and he moved to second when Jordan followed with a single. With one out and two on, Guthrie launched a three-run homer to left, putting Cookies & Cream ahead 11-1. Blose was retired for the first time in the game to end the inning, but Cookies now had a double-digit lead at ten runs. Dinger pitched his fifth consecutive shutout inning in the bottom of the sixth, ending the game quickly by retiring Dustin and Nate in order, giving Cookies & Cream an 11-1 win. 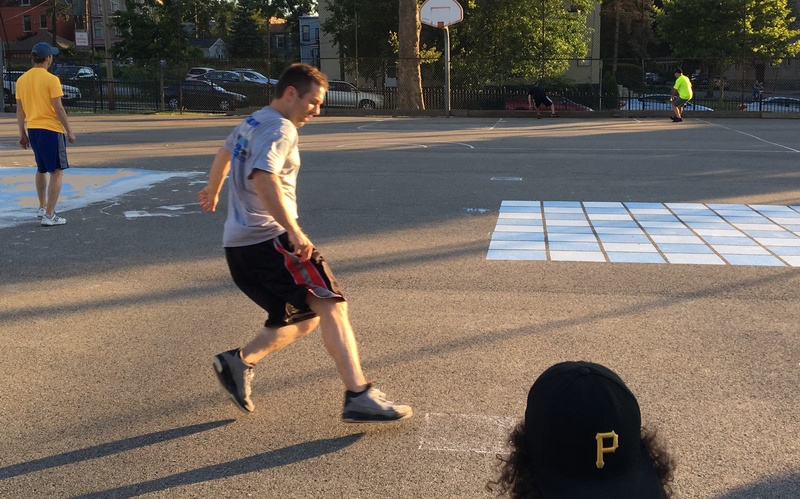 The win moved Cookies to 11-5 for the season, and the loss dropped Eastbound & Dahn to 1-15. – Dinger pitched the complete game win for Cookies & Cream, allowing only a single run on 2 hits in 6 innings. – Cara took the loss for Eastbound, giving up 3 runs on 7 hits in 2 innings pitched. – BK pitched four innings of relief for Eastbound, allowing 8 runs on 9 hits. – Blose led Cookies & Cream on offense, going 5-for-6 with a single, 2 doubles, 2 homers, 4 runs scored, and 2 RBI. – Dustin had the only hits of the game for Eastbound, going 2-for-4 with a single, a homer, a run scored, and an RBI. Bob allowed three runs in the bottom of the first and then pitched seven consecutive shutout innings as Questionable Outfit outlasted the Ham Slams 4-3 in the first game of the 2016 season to go to extra innings. Bob’s solo homer in the top of the eighth put Questionable ahead, and despite racking up 14 base hits, the Ham Slams couldn’t plate a runner after the first inning. Josh took the mound for the Ham Slams, and he escaped the first inning without allowing a run. Miller doubled with one out, but Josh retired Savage Love to strand the runner and end the inning. The Slams got on the board right away in the bottom of the first to take an early lead. Tim started the game with a double, and he moved to third on a Ron Mexico single. With no outs and runners on the corners, Josh singled, scoring Tim to make the score 1-0. Ron Mexico was caught trying to get from second to third on the play for the first out of the inning. Kessler then singled to put runners on first and second, and Tim followed with a triple, clearing the bases and extending the Ham Slams lead to 3-0. Bob then retired Ron Mexico for the second out of the inning, and Questionable Outfit trailed by three runs. Josh stranded another Questionable runner in scoring position in the top of the second. Miller tripled with one out, but Josh again retired Savage love, maintaining the shutout and the 3-0 Slams lead. Josh doubled to start the bottom of the second, but Miller made an incredible outfield assist from deep in right field to catch him in trying to extend the hit into a triple. Kessler followed with a one-out double, but Bob got Tim to groundout to right, stranding the runner and ending the inning. Questionable would cut into the Slams lead in the top of the third. Bob tripled to start the inning, and he scored on a deep sacrifice fly to center by Miller, making the score 3-1. Josh then retired Savage Love to end the inning. Ron Mexico led off the bottom of the third with a triple, but the Slams couldn’t plate the runner, as Bob struck out Josh and got Kessler to fly out to the mound, and the score remained 3-1. Bob helped his own cause in the top of the fourth, leading off the inning with a solo shot to right, and the score was 3-2. Josh avoided further damage, retiring Nate and Savage Love to end the inning. Ron Mexico doubled with one out in the bottom of the fourth, but Bob continued to strand Ham Slams runners, as he retired Josh to end the inning, and the Slams couldn’t add to their lead. Questionable continued to chip away at the Ham Slams lead, tying the game in the top of the fifth. Bob doubled, and he scored on a Miller single, tying the game at 3-3. Miller was caught trying to extend the single into a double for the first out of the inning. Savage Love followed with a double, and the lead run was in scoring position, but Josh got Bob to fly out to Tim in center, ending the inning and stranding the runner. Kessler singled to lead off the bottom of the fifth, and two batters later, Ron Mexico singled to put runners on first and second. But Bob escaped the inning unscathed, retiring Josh to strand both runners, and the score remained tied. Josh cruised through the top of the sixth, retiring Miller and Savage love in order, and the Slams would come into the bottom of the sixth tied at 3-3. Kessler led off the bottom of the final frame with a single. The next batter, Tim, singled, but Kessler was caught in between first and second on the play for the first out of the inning. The winning run was on base, but the Slams couldn’t plate him, as Bob retired Ron Mexico to strand the runner and send the game to extra innings. Josh rolled in the top of the seventh, retiring Bob and Miller in order, giving the Slams a chance to walk off in the bottom half of the inning. Josh singled to start the bottom of the seventh, but for the second time in the game, Miller made an incredible outfield assist, catching Josh in between first and second for the first out of the inning. Bob then retired Kessler, ending the inning. Savage Love was retired for the first out in the top of the eighth, and Josh had sent down six consecutive Questionable Outfit hitters. He couldn’t get to seven, however, as Bob crushed a solo homer to right, putting Questionable Outfit ahead for the first time in the game. Miller followed with a double, but Josh limited the damage to a single run, retiring Savage Love to strand the runner and end the inning. Down a run in the bottom of the eighth, the Ham Slams couldn’t rally. Bob retired Tim and Ron Mexico in order, and Questionable Outfit had pulled off the come back, scoring four unanswered runs to top the Ham Slams 4-3. The win moved Questionable Outfit to 13-3, and the loss dropped the Ham Slams to 7-9. – Bob pitched the complete game win for Questionable Outfit, allowing 3 runs on 14 hits in 8 innings pitched, striking out one. – Josh took the loss for the Ham Slams, giving up 4 runs on 9 hits in 8 innings. 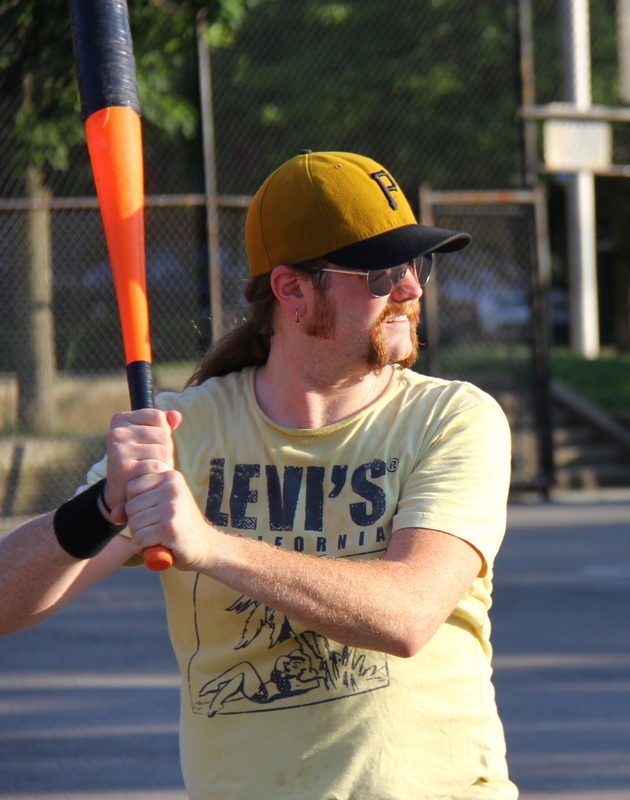 – Bob led Questionable Outfit on offense, going 4-for-8 with a double, a triple, two homers, 4 runs scored, and 2 RBI. – Ron Mexico led the Ham Slams at the plate, going 4-for-7 with 2 singles, a double, and a triple. 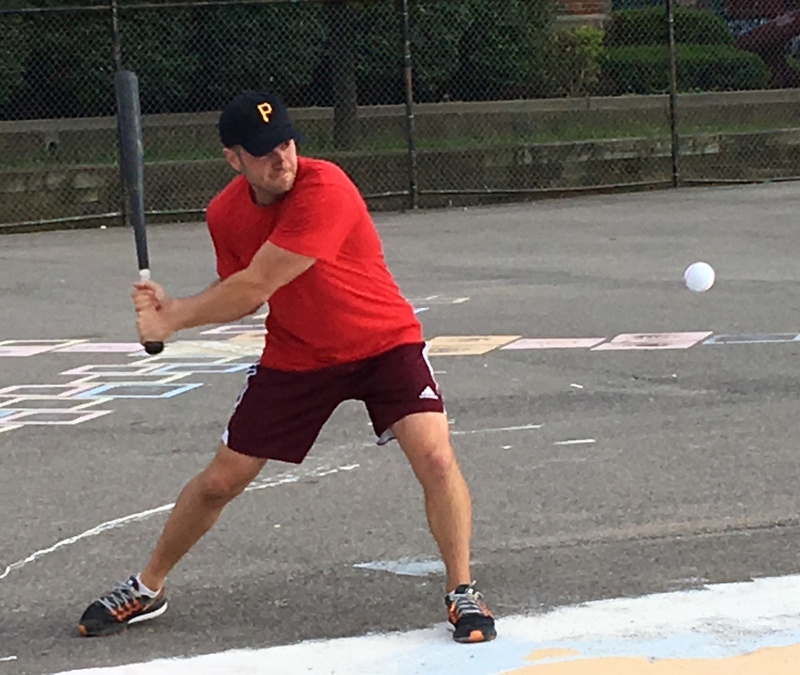 Despite playing with a depleted lineup, Questionable Outfit, led by Bob and Miller, scored at least a run in all but one inning and beat Eastbound & Dahn 6-2 to maintain their hold on first place in the season standings. Miller took the mound for Questionable Outfit, and he retired the side in order in the top of the first, sending Dustin and Nate down consecutively. BK got the start for Eastbound, and the first batter he faced, Bob, singled. Miller then provided his own run support, crushing a two-run homer to left, and Questionable Outfit led 2-0. Gene Creemers, filling in for Questionable, followed with a single, but was doubled up when Bob flew out to BK in the mound, and BK also caught Creemers in between first and second, ending the inning with a double play. Cara would single with one out in the top of the second, but Eastbound couldn’t get on the board, as Miller retired Dustin to strand the runner and end the inning. Miller started the bottom of the second with a single, and two batters later, he scored from first when Bob hit and RBI single off the wall, putting Questionable ahead 3-0. BK then retired Nate to end the inning and avoid further damage. Nate led off the top of the third with a single, but once again, Miller would strand an Eastbound runner, as he retired BK and Cara to maintain the 3-0 lead. BK retired the side in order in the bottom of the third. and Questionable led 3-0 midway through the game. Eastbound got on the board in the top of the fourth. Dustin led off with a single, and Nate followed with a single, but Dustin was caught trying to advance from first to third on play. BK singled with one out to put runners on first and second, and Cara followed with an RBI single, scoring Nate to make the score 3-1. Eastbound had runners on first and third and the tying run on base, but Miller retired Dustin, stranding two runners and ending the inning. Questionable made up the different in the bottom of the fourth. Gene Creemers doubled with one out, and Bob drove him in with an RBI single, making the score 4-1. Miller then tripled, scoring Bob to push the score to 5-1. On the play, Miller tried to complete an inside-the-park homer and was caught between third and home, ending the inning. Miller cruised through the top of the fifth, sending Nate and BK down in order. After four innings of keeping the Questionable bats relatively in check, BK was removed from the game and Eastbound put Cara on the mound. Questionable would add one final insurance run in the bottom of the fifth when bob hit a solo homer with one out, extending the Questionable lead to 6-1, and Eastbound would head into the top of the sixth trailing by five. Cara started the final frame with a single, and she moved to second when Dustin singled. Nate then doubled, scoring Cara, and the Questionable lead was cut to 6-2. Eastbound had no outs and two runners on, but Miller gathered himself and ended the rally abruptly. He fanned BK, and Cara flew out to the mound for the second out, ending the inning, as Questionable held on to win 6-2. 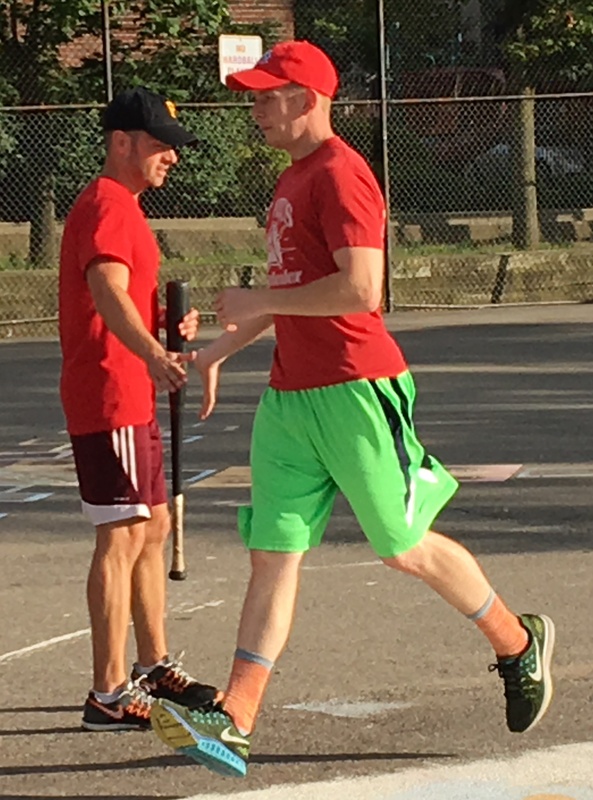 The win moved Questionable Outfit to 12-3 for the year, and the loss dropped Eastbound & Dahn to 1-14. – Miller pitched the complete game win for Questionable Outfit, allowing 2 runs on 9 hits in 6 innings, striking out one. – BK took the loss for Eastbound, giving up 5 runs on 8 hits in 4 innings. – Cara pitched one inning of relief for Eastbound & Dahn, allowing 1 run on 1 hit. 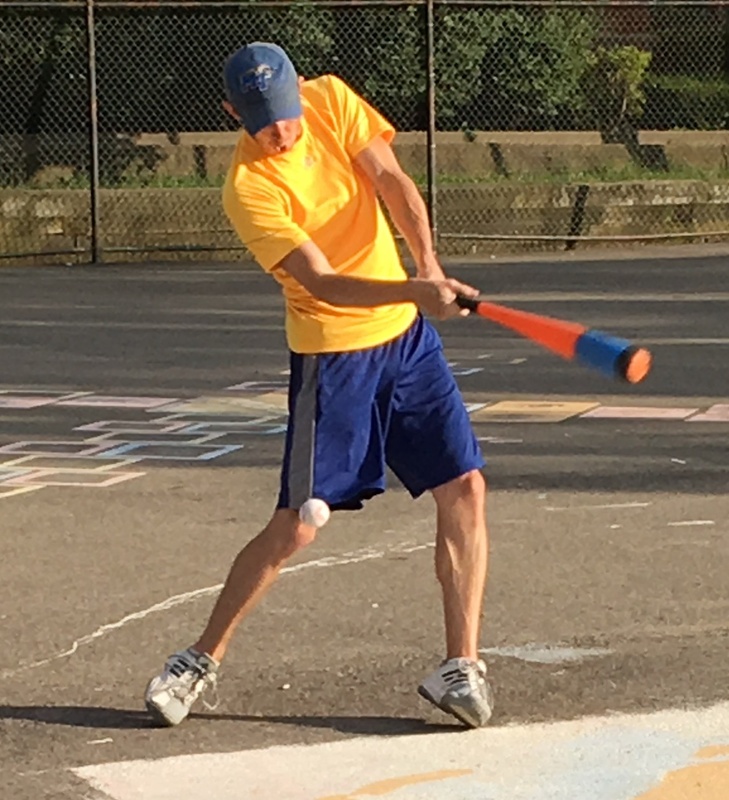 – Bob led Questionable Outfit on offense, going 4-for-6 with 3 singles, a home run, 4 runs scored, and 3 RBI. – Miller also went 3-for-6 for Questionable with a single, a triple, a homer, 2 runs scored, and 3 RBI. – Nate led Eastbound & Dahn at the plate, going 3-for-5 with a 2 singles, a double, a run scored, and an RBI.